LOS ANGELES, California, December 6, 2017 (ENS) – Hundreds of thousands of people are displaced tonight as wildfires driven by Santa Ana winds roar through the forests of southern California, devouring all homes and other structures in their path. About 200,000 people are under evacuation orders, but no deaths and few injuries have been reported. Among the injured are three Los Angeles Fire Dept firefighters; all are reported to be in stable condition. 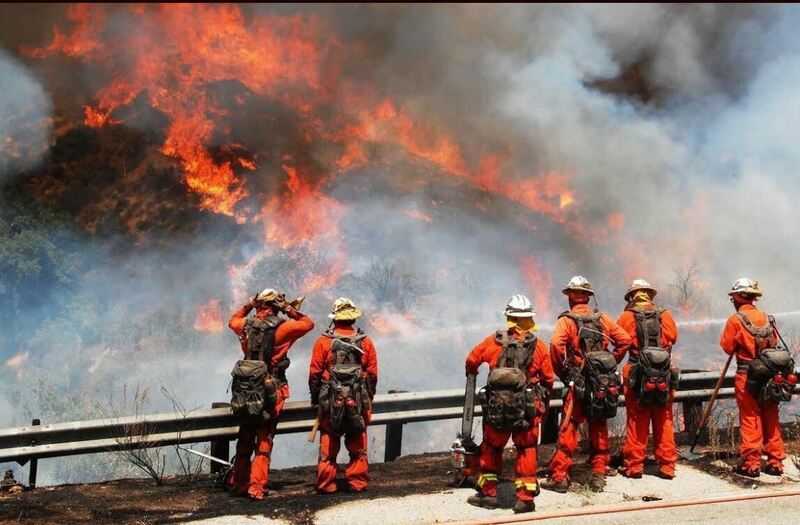 Trees in two national forests are ablaze – the Los Padres National Forest in Ventura County, and the Angeles National Forest in Los Angeles County. 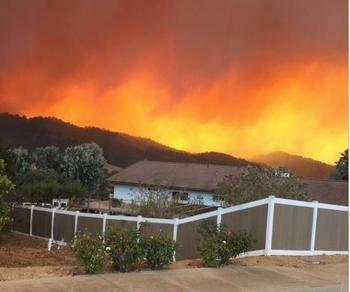 In Ventura County, the Thomas Fire started on the evening of December 4 in upper Ojai near Thomas Aquinas College in the city of Santa Paula. Pushed by strong winds, the Thomas Fire spread rapidly and has now consumed more than 96,000 acres and destroyed 150 homes and other structures. The blaze is established on the north and east side of Highway 150 and on the west side of Highway 30. The fire has pushed northwest of Ventura and has reached Highway 101. Some 1,775 firefighters are battling this blaze with 362 fire engines, 12 helicopters, air tankers, hand crews and bull dozers. Even so, fire officials say the Thomas Fire will continue to threaten the cities of Ventura, Ojai, Santa Paula, Casitas Springs and unincorporated areas of Ventura County and spread to the west toward the city of Ojai and continue to move to the southeast into the City of Ventura. With the continuing forecast for northeast winds and low humidities, fire will continue to spread with high winds, warns the incident command team. A total of 1,510 firefighters are at the scene of the Creek Fire north of San Fernando on and south of the Angeles National Forest. In Los Angeles County, the Creek Fire was reported at 3:44 am Tuesday. The large, wind-driven brush fire is burning in the hills near Sylmar and Sunland-Tujunga in chaparral, brush and tall grass. It has grown to 11,377 acres due to extreme fire behavior and strong, gusty winds. At least 2,500 structures are threatened and 110,000 people have been evacuated. The fire is being managed under Unified Command with the U.S. Forest Service, Los Angeles County and Los Angeles City. This fire is right in central Los Angeles; 55 L.A. Unified schools were closed and evacuated today due to the wildfires. Later tonight more evacuations were ordered as yet another fire broke out, this one in the area of the Getty Center and Skirball Center. This fire is in the area of homes and evacuations have been ordered. An evacuation advisory has been issued for areas west of the 405 Freeway. Be prepared to evacuate in the areas west of the 405, between Mulholland to the North, Sunset Blvd to the South and Mandeville Canyon Road to the West. Governor Jerry Brown has issued emergency proclamations for both these counties, freeing up resources to help them deal with these disasters. There has been a heartwarming outpouring of help for the evacuees and of prayers for the firefighters on the front lines. The ridesharing company Lyft is offering free rides to evacuees. People are opening their homes to evacuees, offering couches if they don’t have spare bedrooms. Neighbors are helping to lead threatened horses to safety. The American Red Cross is providing safe shelter and support for people with no other place to go, and about 430 people took refuge from the fires overnight in seven Red Cross shelters. The Red Cross says everyone is welcome. People do not need to be American citizens to receive Red Cross assistance. The Red Cross and partners are providing care for evacuated pets. Service animals and therapy pets are welcome at Red Cross shelters. The South Coast Air Quality Management District says smoke from the Creek Fire and Skirball Fire is causing poor air quality in the San Fernando Valley and in Los Angeles County Coastal areas. The air quality experts advise that if you are in an affected area, avoid unnecessary outdoor activity and keep windows and doors closed. People with heart or lung disease or asthma, the elderly and children should take extra precaution.